Tuna Mornay is comfort food on a shoestring budget. This meal is a quick, easy, budget-friendly, and the perfect mid-week meal to thaw you out on a cold winter day! You should also check out our classic tuna casserole! We’ve really been trying to boost the amount of fish in our families diet. 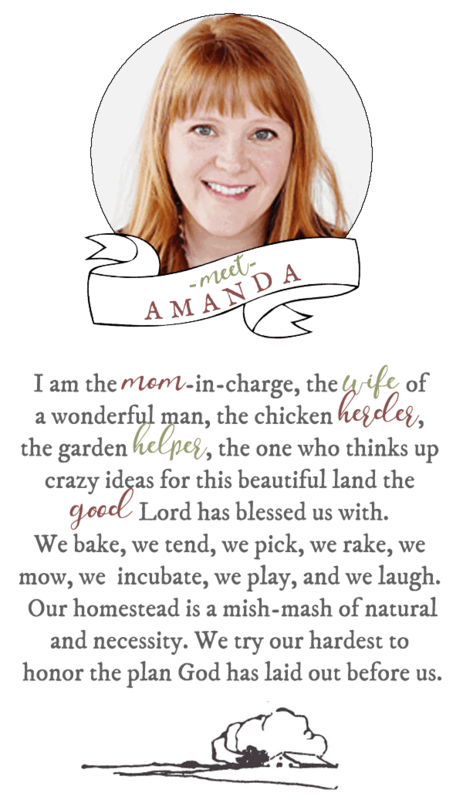 Looking for ways to incorporate fish into some of our families favorite dishes has been kind of fun! Tuna Mornay was an instant hit with the kids. 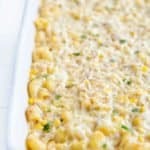 The corn provides a sweet undertone that compliments the creamy and savory foundation. Also, this is an easy dinner that can be pulled together from whatever ingredients you have lying around. You can add different vegetables or spices to change the flavor to your liking. 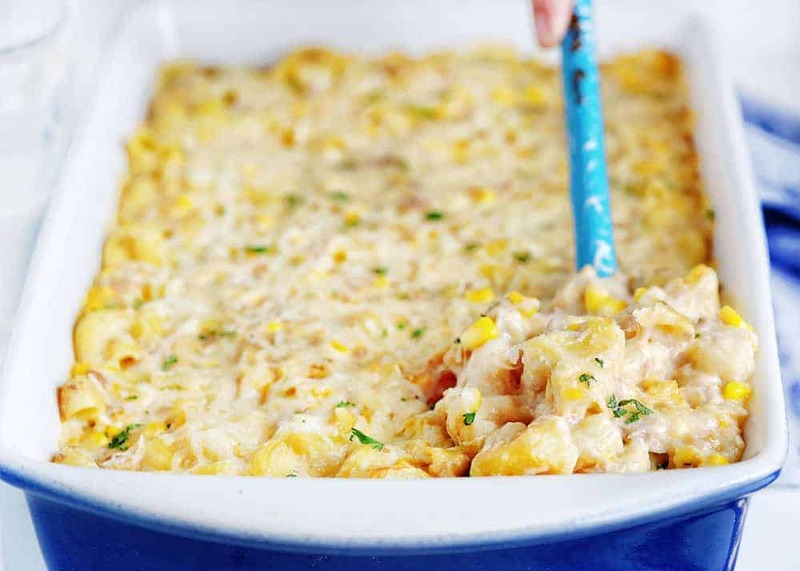 Tuna Mornay gets its name from the white sauce or “mornay” sauce. A Mornay sauce is basically a bechamel sauce with cheese. Bechamel is the foundation, it a white sauce made from a flour and butter roux and whole milk. To turn a bechamel sauce into a mornay sauce, you simply add lots and lots of cheese. Just kidding, that is just how we do it. You do add cheese, though. Back when Mornay Sauce was first invented, they used only gruyere cheese. If you have ever tried to buy Gruyere before, you know that it is ridiculously expensive. If you want to try it, be my guest, but if you are looking to stick to your cheese budget, you can still make a Mornay Sauce with Cheddar and Parmesan as we do in this recipe. How Do You Make Tuna Mornay? For this dish, you are going to start by preparing your noodles. I like to use salted water because it adds flavor to the water, which is absorbed by the food. It also increases the boiling point of the water (increasing the temperature) and that makes your noodles cook better. Al dente just means that the noodles are cooked until they are firm and chewy but not soft or soggy. This is very important to pasta because it will continue to cook after being removed from the water. Most of the boxes or bags that you buy pasta in will indicate how long to cook the noodles. Most of the time it is around 12-14 minutes. We used Macaroni noodles, but you could use whatever noodle you prefer. When they are done, drain them and set them aside. While your noodles are cooking, heat up your skillet and drop in some oil and your onions. Cook these until they are fragrant and translucent and then set them aside. A Roux (pronounced “roo”) is a thickening agent for soups and sauces and is typically what gives dishes like this a thick and creamy body. Roux is made by cooking equal parts flour and fat together until the flavor of the flour is cooked out completely. For our roux, we use butter, flour, salt, and pepper. Typically, roux is cooked quickly and constantly, whisking so it doesn’t burn or overcook. You will only cook this for one minute total. Whisk in the milk and keep stirring until it is fully blended and starts to boil. You can now reduce the heat to low and let it simmer. Keep whisking until it is thickened. 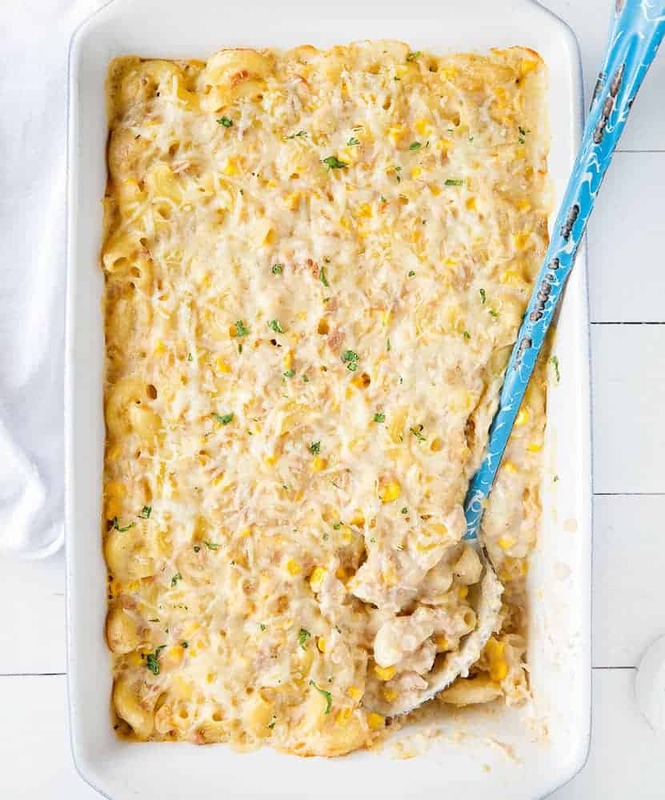 To turn your roux into the cheesy goodness that will make this tuna mornay, you will add in the cheeses. Start by removing the pan from the heat and stir in one cup of each the parmesan and cheddar cheeses. Stir until it melts into the mixture. Make sure to save that extra cheese because we are going to melt it over the top! 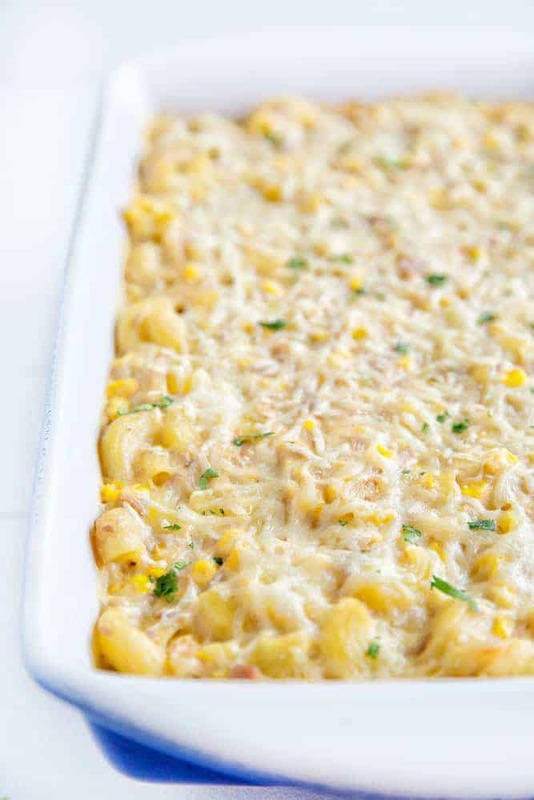 In a large mixing bowl, combine the tuna, corn, creamed corn, sauteed onions, and noodles. Mix until it is all combined and then pour in the cheese mixture. Stir everything together until it is fully incorporated. Now you can pour it into a greased baking dish and top with the remaining cheese. Looking for More Tuna Recipes? Tuna Mornay is comfort food on a shoestring budget. This meal is a quick, easy, budget-friendly, and the perfect mid-week meal to thaw you out on a cold winter day! In a large pot of boiling salted water, cook the macaroni noodles to al dente and drain, set aside. While the noodles are cooking, heat olive oil in a skillet or frying pan. Once hot, add onion and saute until translucent and fragrant, set aside. In a medium pot over medium heat melt butter, add flour, salt, and pepper and whisk constantly for one minute. Slowly whisk in the milk and stir constantly. When sauce starts to boil, lower the heat to simmer and whisk until thickened. Remove from heat and add 1 cup parmesan cheese (reserve remaining for topping) and 1 cup cheddar cheese, stir to combine. 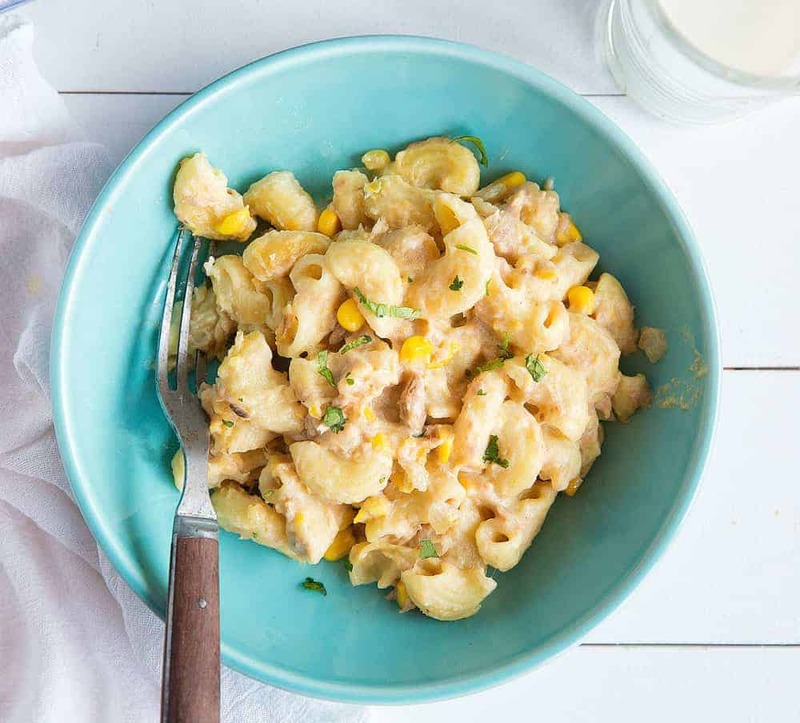 In a large mixing bowl, combine tuna, corn, creamed corn, sauteed onions, and noodles. Mix until well combined. Add the cheese mixture and stir until fully incorporated. Pour into baking dish, top with remaining parmesan cheese. Bake 20-25 minutes or until cheese topping turns golden brown. Can you tell me how many calories there are in a serving? Can you use can chicken breast instead of tuna? Serves 6???? More like 16. I should have caught on while assembling all ingredients.